The Envoy low effort embossing press is ideal for embossing large quantities of documents without incurring strain or exhaustion. The Envoy press is fixed to the desk or bench allowing the operator to emboss the paper while seated comfortably. The Envoy press has a rolling grip system that minimises strain on the wrist or hand. The press can emboss onto papers of up to 140GSM (grams per square meter) with an impression size of up to 45mm diameter. Ideal for embossing membership cards, permits and certificates. 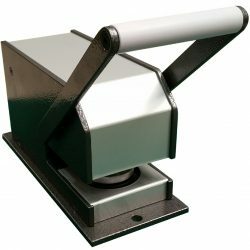 Our extensive range of lever operated machines are for embossing heavy papers or where a large numbers of seals to be made. Dies of up to 75mm (3") diameter or 80mm x 35mm (3.15" x 1.4") are possible. Throat sizes range from 55mm (2.15") up to 150mm (6") from the centre of the die to the back of the press. If the paper can be curled, the reach can be extended. We also have a range of leather stamps for debossing bridle leather for harnesses, belts and leather key fobs. The press bodies are of either cast iron or aluminium depending on the duty. The larger machines, Consular, Ambassador & Regal, are often used to produce detailed armorial designs and Vesica Piscis shaped ecclesiastical seals. Security can be assured by a the addition of a locking bar and one or two padlocks as an optional extra, at extra cost. Site Admin | Copyright © 2019 Bolsons ltd. All rights reserved. By continuing to view this website, you agree to accept cookies from us.